Mucho Burrito is my favourite fast food (I'm told it is similar to Chipotle, but Ottawa doesn't have one of those, so I've never tried it). 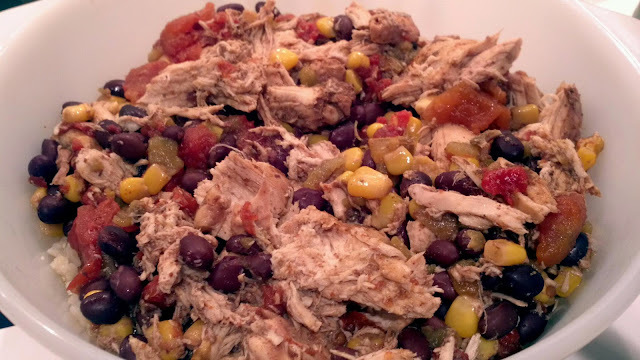 This slow cooker recipe can either be used to stuff a tortilla to achieve a similar flavour to Mucho, or it can be served over brown rice and topped with shredded cheddar, salsa, guacamole or sour cream. When choosing canned vegetables, I recommend 'no salt added' varieties to keep sodium content down. Chopped green chilies can be found in the Mexican section of the grocery store. I used Old El Paso brand chilies. Drain black beans and diced tomatoes and place in slow cooker pot. Add green chilies and corn. On top, layer chicken breasts and then season chicken with chili powder, cumin and black pepper. Pour broth in and place lid on for four hours on high. When four hours is complete, remove lid and break up chicken into chunks using a wooden spoon. Serve over brown rice or on a tortilla and top with cheese, salsa, guacamole or sour cream.